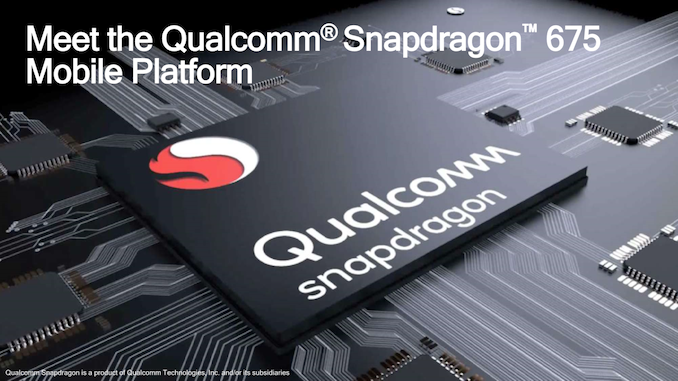 Today we’re seeing a very interesting announcement from Qualcomm: The new Snapdragon 675 chipset is a direct successor to the current generation Snapdragon 670 which was only announced back in August. The Snapdragon 675 iterates on the current design, bringing some important upgrades. The new SoC platform is Qualcomm’s first to employ the newest generation “Kryo 460” CPU microarchitecture. Obviously Qualcomm is still using Arm’s “Built on Arm Cortex Technology” CPU license, meaning the SoC uses a customised order of the Arm IP. What is very exciting to see is that the Snapdragon 675’s Kryo 460 performance CPUs are based on the new Cortex A76 cores. I think this is the first time that a SoC vendor actually introduces a new CPU microarchitecture in a mid-range product first, as I had expected Qualcomm to unveil it in the upcoming Snapdragon flagship. The performance cores come in a 2x configuration clocking at up to 2GHz, accompanied by 6x Cortex A55 derived efficiency cores, running at up to 1.8GHz. 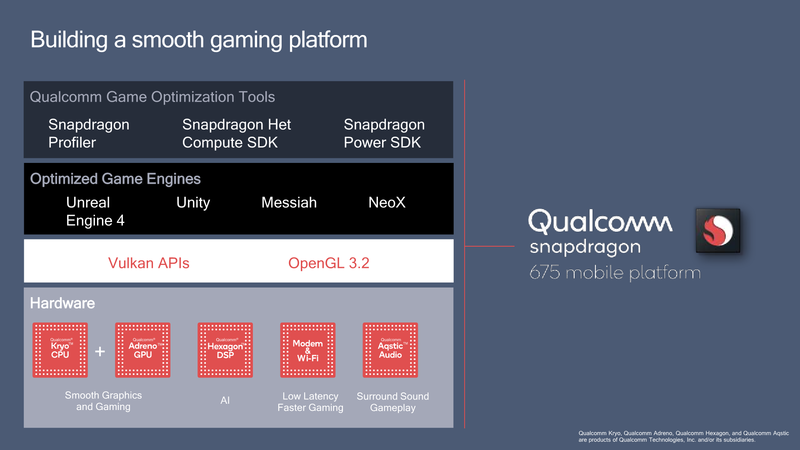 The CPU performance improvements over the Snapdragon 670’s Cortex A75-based Kryo setup are quoted by Qualcomm to range from 15% in app launches, up to 35% in web browsing scenarios. This roughly matches Arm’s claims of the IPC improvements of the new microarchitecture, and because the Snapdragon 675 is running at the same clock as the Snapdragon 670, the performance improvements are actually due to just the new generation cores. What also is quite weird is that the new SoC should in effect also outperform the Snapdragon 710 – even though the latter is in a higher tier segment. 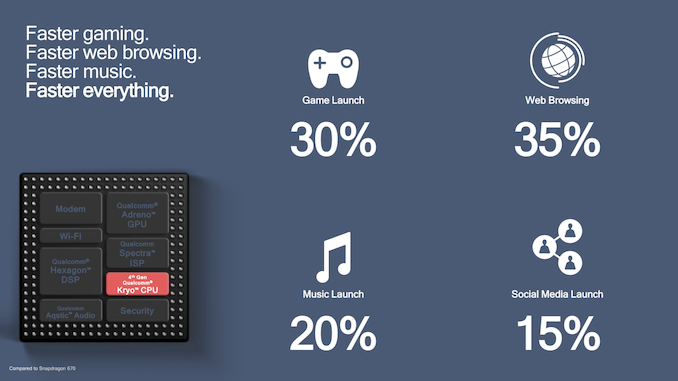 We’ll likely see a successor to this platform sometime in the future. As of time of writing, Qualcomm didn’t talk much about raw performance improvements of the GPU. It’s still an Adreno 61x series GPU, and I expect it to be in the performance range of the Adreno 615 or 616. 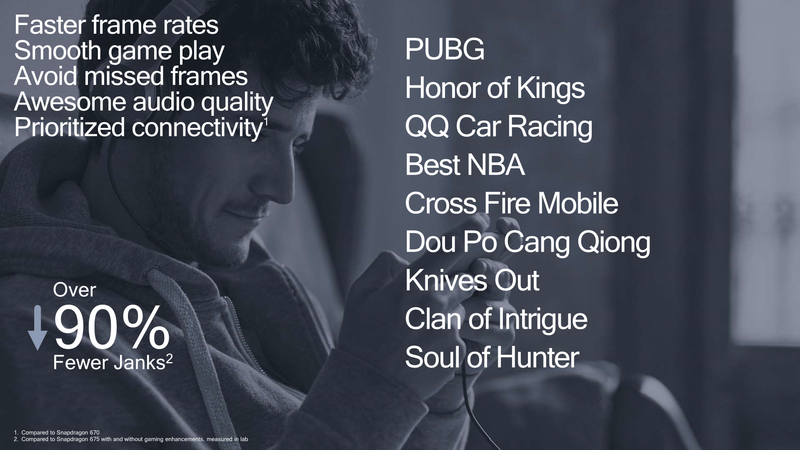 What Qualcomm did talk about, is that the new SoC employs some sort of software “gaming enhancements” that promise up to 90% fewer janks. Again I followed up with a request with more technical explanation as to what this is, but with no official response as of yet. What is very obvious here is that this sounds strikingly similar to Huawei/Honor’s “GPU Turbo” mechanism in what it promises to achieve. Hopefully we’ll have a more detailed explanation in the future. Similar to GPU Turbo, these gaming enhancements appear to be game title specific. An improvement on the ISP side is the new support for seamless triple-camera setups. The new Snapdragon 675 adds an additional MIPI CSI port, totalling up to three. This allows the new SoC to be able to operate three cameras at once, which is something that will seemingly become very popular in the comings months as more devices with telephoto, wide-angle, and super-wide angle modules are announced. Here the ISP hardware needs to be capable of enough in terms of throughput to deal with the large amount of pixel data from the sensors. 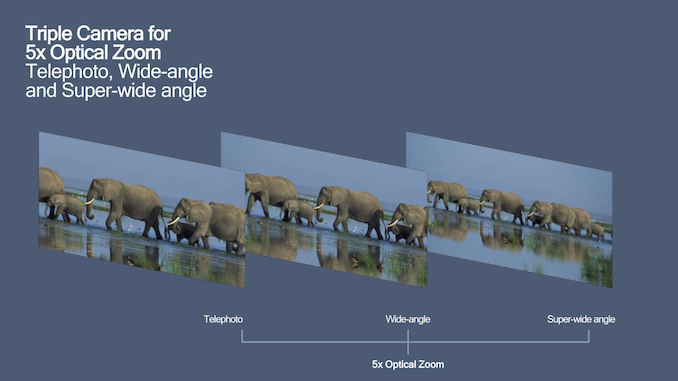 Qualcomm enables the hardware and software to support both bokeh (portrait modes) and HDR shots in a single shot. 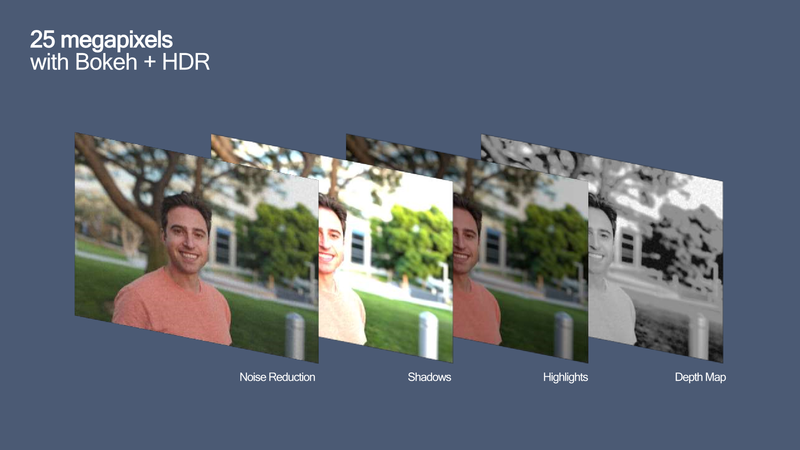 Bokeh effects are supported by multiple techniques; either stereo depth sensing via dual cameras, active depth sensing via time-of-flight, or just simply by a single camera sensor which has phase detection pixels. First Samsung 11nm “11LPP” product? What surprised me even more than the announcement of a Cortex A76 mid-range SoC, was the revelation that it’s manufactured on Samsung’s new 11LPP manufacturing node. Samsung’s 11nm node is a mix of its 14 and 10nm nodes, and is targeted for cost-effective solutions while still maintaining performance competitiveness with the 10nm products. Qualcomm didn’t talk much about power efficiency of the Snapdragon 675, and it’s likely that we won’t be seeing any major improvements. Again it’s remarkable to see Qualcomm having such short product refresh cycles in this range, as seemingly competition is fierce and pricing in the mid-range is a cut-throat business in order to achieve design wins. 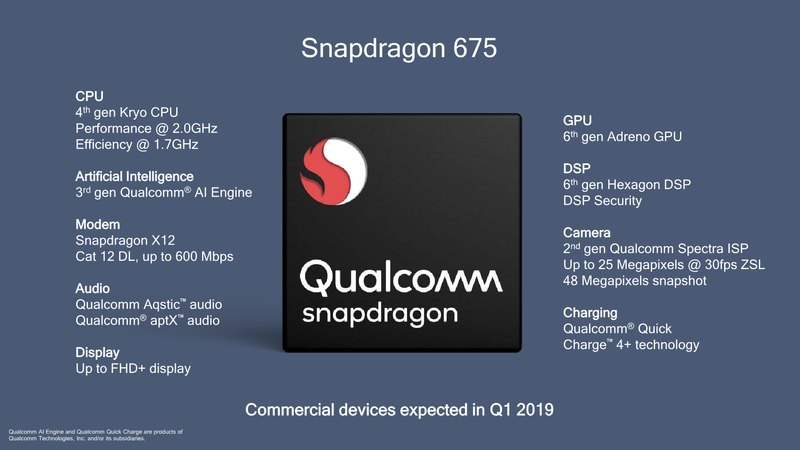 The big remaining question is where and when does the Snapdragon 675 position itself against its current counter-parts? The new SoC is scheduled to be available in commercial devices in Q1 of 2019. As Snapdragon 670 devices have already started to launch, the two products will co-exist with each other for some time. A depth map is exactly what it sounds like: the intensity of a pixel correlates to the object's distance from the camera. This actually looks like it's ment to be by its wide adopteption rate the successor of S636 and by it's design philosophy of the S650. It's directly aimed against the Mediatek Helio P60 and it's successor series. 11nm LPP is a last Samsungs 14/16 nm renamed node ment to complete against also similar renamed TSMC's 12nm one (upon which the P60 is made), its a cheapest FinFET node which is a good thing. On the other hand A76's on it (even in quantity of only two) won't be efficient which brings me to a conclusion that price will be paid in maximum GPU clock as there is a reason QC is branding it as lower tier A612 even we know it's a same single cluster design as the A615/A616 are. It will probably at least match the A512 performance while being more power efficient. From a design standard point the S675 looks very promising bringing to users only what they really need all do 11nm FinFET have much sense from economic standpoint the GloFo 22nm FD-SOI would have even more sense & additional benefits (price, lower standby power consumption, much lower RF & mixed power consumption) there is still a concern about A76's power consumption on that note. 11nm FinFET is still behind density & efficiency of even first gen of Samsung 10nm FinFET not to mention third one called as 8nm FinFET but that will probably be resolved for S7xx series successors. The key thing about the 650, 636, 660 and 675 are that they're good enough for most tasks. They're not the fastest SoCs but the combo of low price, high CPU and GPU performance and high efficiency make them perfect for the $200-400 market. I'd rather not get something like a Poco F1 with a flagship chip and corners cut everywhere else to meet a low price point. Big cores typically have 2-3x the IPC of small cores (more cache, more pipelines, out of order execution).